Climate refers to the average weather patterns that occur within a region over a long period of time, typically 30 years. The average conditions of the atmosphere represented by climate over an extended period time including its precipitation and air temperature levels. Climate is traditionally classified in terms of the average annual precipitation, monthly precipitation, and atmospheric temperature. A common approach to climate classification is the Koppen system, named after Wladimir Koppen who first devised the classification system in 1884. An additional highland climate was later added to the system to account for the differences in climate in the same region at higher elevations such as the difference in climate between the high Andes and its foothills. Tropical climates have high temperatures and precipitation rates. Regions with tropical climates are typically rich in vegetation and animal life. Tropical climates typically occur along the equator and include areas such as northern South America, Southeast Asia, equatorial Africa, and the Caribbean. Like tropical climates, dry climates tend to have high atmospheric temperatures, but, in contrast, dry climates have low precipitation rates. Because of these low precipitation rates, vegetation is typically scarce. Regions known for having dry climates include the Saharan region of Africa, the American Southwest and the Atacama Desert in Chile. Temperate climates have temperatures that are typically lower than tropical or dry climates. They have less precipitation than tropical regions but more than dry regions. Their summers can be warm or hot and their winters tend to be mild. Temperate climates are common in regions such as the Mediterranean basin, parts of eastern and central China, and the southeastern U.S.
Continental climates are common in the interiors of continents, hence their name. Areas with continental climatic conditions will have warm summers and cold winters. The northeastern United States and Russia are areas known for having a continental climate. Polar climates, as their name implies, occur in the polar regions in the northern and southern hemispheres. They are characterized by very cold summers and winters. Polar climates also tend to be very dry, but nonetheless are covered in ice and snow because the ice does not melt easily. Greenland and Antarctica have a polar climate. What is a Climate Change? Over time, the climate can change due to changes in factors such as temperature and atmospheric composition. A recent example of climate change is global warming, a trend first discovered in the 1960s, in which global average temperatures have been increasing steadily due to a build-up of carbon dioxide and other greenhouse gases in the atmosphere. This could change the types of climate common on the planet. For example, the melting of the ice sheets and glaciers due to global warming may result in the eventual disappearance of polar climates. A biome is a set of biological communities defined primarily by similar vegetation and is also influenced by factors such as climate and geography. Depending on the range of vegetation making up a single biome, a biome can be restricted to a specific region of a planet or it can extend across the entire surface. Biomes are affected by climate and geography, but they are primarily classified by their vegetation. There is no agreed upon classification of biomes, but a common one is to divide them into terrestrial biomes, freshwater biomes, and marine biomes. Forest biomes are some of the most diverse biomes. Their defining characteristic is the presence of trees. Forest biomes can be temperate, tropical, or boreal. Temperate forests occur in eastern North America, western Europe and other areas with a temperate climate. They are characterized by clearly defined seasons and a distinct winter season which can include snow. 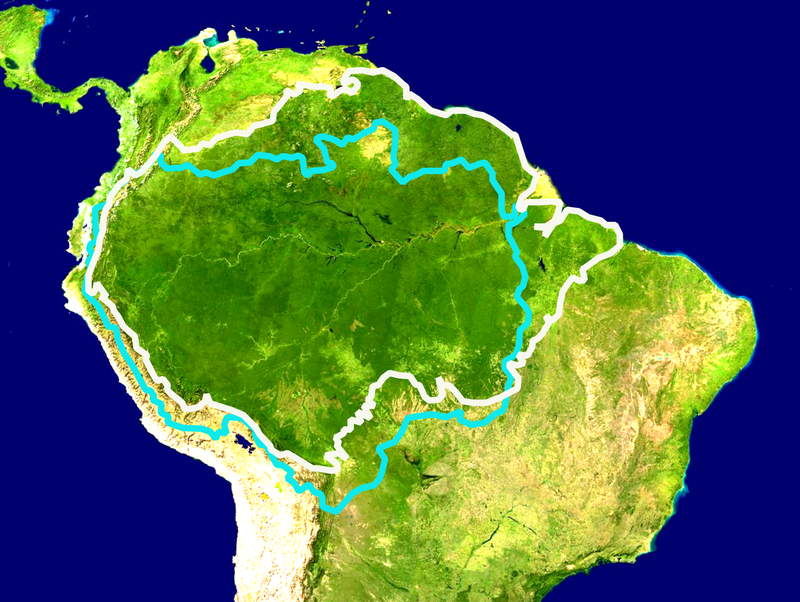 Tropical forests occur in regions between 23.5 degrees north and 23.5 degrees south of the equator. They tend to only have a dry season and a rainy season without other distinctive seasons. Boreal forests occur between 50 and 60 degrees latitude and form one of the largest terrestrial biomes. They are common in areas characterized by mild wet summers and long, cold and dry winters. Grassland biomes typically occur in areas that are drier than regions ideal for forests. Grasses are abundant while trees and shrubs are rare or absent. Grassland biomes became widespread in the Miocene 25 million years ago in western North America as high mountains formed, changing the climate and causing the decline of primeval forests. Desert biomes consist of the plants that thrive in regions with very low precipitation levels. Desert biomes are found in North Africa, the American Southwest, and other areas with low precipitation. Deserts are always dry, but they are not always hot. The interior of Antarctica is also an example of a very cold desert. Tundra biomes are very cold and characterized by very low biodiversity, short growing seasons, and excessive reliance on dead organic matter for energy. The vegetation that exists in tundra also tends to be fairly simple in its structure. Biomes also extend to bodies of water. Freshwater biomes include plants that exist near or within freshwater bodies such as lakes, rivers, and ponds. Marine biomes include oceans, coral reefs, and estuaries. The Ocean biome is the largest biome type on Earth. It can be subdivided based on water depth and location into shore/intertidal, benthic, pelagic, and abyssal zones. Biomes and climates are both determined by atmospheric temperature and precipitation. The climate and biome of an area can also both be inferred based on plant life in a given region. Furthermore, climate significantly influences what biomes will exist in a particular locale. Although there are some similarities between a climate and a biome, there are also significant differences. These include the following. Climate is classified based on atmospheric temperature and precipitation whereas a biome is classified primarily based on uniform types of vegetation. Climate can determine what biome is present, but a biome typically does not control or influence the climate in the same way. Climate pertains to atmospheric science while the concept of a biome pertains to biology. Climate is the average weather of a region over a long period of time. Climate is typically classified according to air temperature and precipitation. A Biome is a biological community based on similar vegetation spread out over a region that can encompass a limited geographic area or an entire planet. Biomes and climates are both influenced by temperature and precipitation. The main differences between climates and biomes is that climate is primarily determined by temperature and precipitation while biomes are classified according to the vegetation within them. Climate is primarily a matter of atmospheric processes while biomes are a matter of biology and ecology. Furthermore, the climate determines what biomes will be present while biomes do not determine the climate in the same way. Caleb Strom has a B.SC. in earth science from the University of California San Diego and is currently a graduate student in geological sciences at California State Polytechnic University Pomona. He has done scientific research in planetary science at the Scripps Institution of Oceanography and astrophysics at the Center for Astrophysics and Space Science at UC San Diego. Caleb Strom. 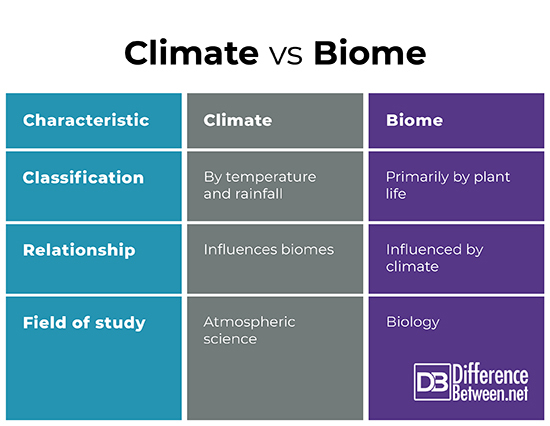 "Difference Between Climate and Biome." DifferenceBetween.net. April 11, 2019 < http://www.differencebetween.net/science/difference-between-climate-and-biome/ >. Harris, Daniel C. "Charles David Keeling and the story of atmospheric CO2 measurements." (2010): 7865-7870. Oerlemans, Johannes. "Quantifying global warming from the retreat of glaciers." Science 264.5156 (1994): 243-245. Vaughan, David G., et al. "Observations: cryosphere." 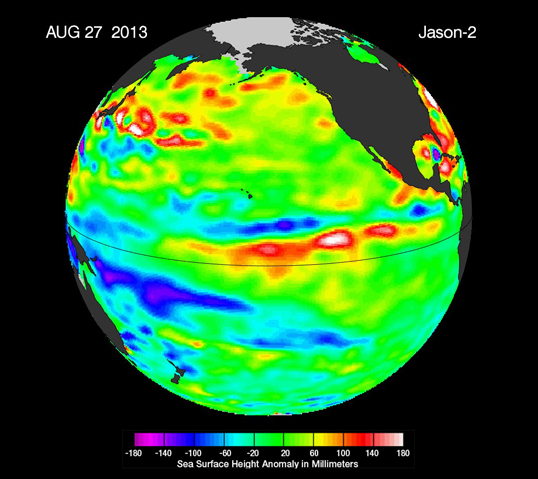 Climate change 2103 (2013): 317-382. Alley, Richard B. The Two-Mile Time Machine: Ice Cores, Abrupt Climate Change, and Our Future-Updated Edition. Princeton University Press, 2014. Parker, Wendy, "Climate Science", The Stanford Encyclopedia of Philosophy (Summer 2018 Edition), Edward N. Zalta (ed. ), .